Saori will be joining us today, after the same old intro we always have. Kisora is getting really good at reading those lines. 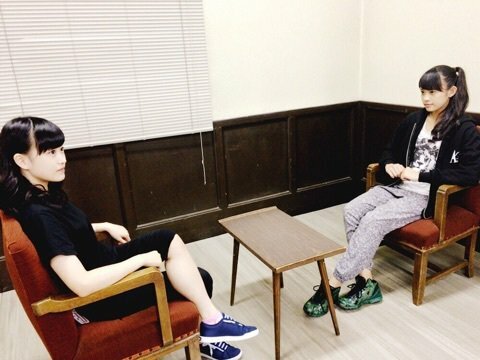 Saori says she’s nervous to be on the show for the first time, but unlike other members who have gotten very soft-spoken due to their nerves, Saori spits out her words, rapid-fire. We could be in for quite the show. She takes a minute to go into hasty detail about how she’s nervous, but excited. Very that. 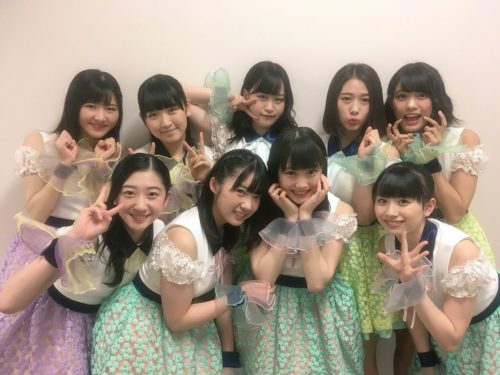 Fan Letter #1 – Tokimera wa Nanaba writes in first, asking about any special training the members do to prepare for concerts. 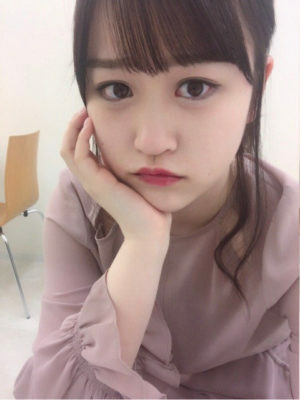 Saori does a lot of sit-ups, usually, but as she wrote in her blog, she’s been skipping them lately. So while she said sit-ups, she actually means no sit-ups. Instead, Kisora adds that almost everyone in H!P has been into squats lately. She said that backstage at Hello!Cons everyone is doing them. Not a lot of them, but it’s enough that Saori gets sore the next day from doing them. Kisora encourages her to continue working out in preparation for their upcoming performances, as that is still very important. Saori thinks they should all do training together. Kisora says she’ll check her schedule. Next letter. The Tsubaki of the week is Ono Mizuho, which has given both her and Kisora the giggles. Turns out they talk a lot together, these two, so we are warned at the start that the whole show might be like this. However, now that we’re a month into these shows, Kisora realizes that they really only have time for the one segment of fan letters, and the longer they take to get to that, the more empty the very short show feels. That’s why it’s all business suddenly as she dives right in. Fan Letter #1 – One Stone, Two Chops writes in to say that they went to a recent Hello!Pro Shop event where they showed footage of backstage at NakaG Fest. After seeing this, they’d like to know what the Tsubakis do while they’re waiting to go on stage. 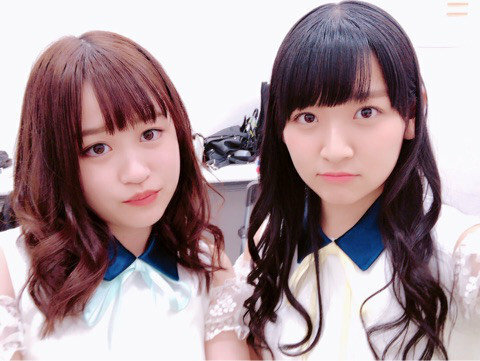 Mizuho says that she hangs out with Saori (and other girls, but mostly Saori) backstage, and she usually gets her to pat her on the back. Hard. It’s a common ritual for Japanese people to help build courage and get rid of nerves. Kisora has done this too, but she knows of Mizuho’s practices especially because sometimes Ono makes a noise afterward into the microphone she’s often holding. Ono gets flustered, saying that it was really right before the show, and she whacked her on the back and all of a sudden she heard her own “wah” resounding in the audience. Everyone had a good laugh, however, and it was fine. Kisora says that also do their group chant and breakdown right before the show, which helps get them in the right state of mind. Back with Kisora in the studio, now with added Kiki! Kiki echoes the sentiment that several of the members have had on this show, which is to say that she wasn’t nervous until she got into the booth to record. However, more so than any of the other members, she actually sounds kind of scared and reserved. Poor tiny bean. Sometimes I wonder if they adjust more quickly because the show is short and they don’t have to suffer long, or if it takes longer because they don’t get enough time to settle. Hard to say, but it is an irrefutably short show, so on to the letters! Do not worry, Kisora will save you. Back again with our main MC, Kisora, and her partner this time is Kishimoto Yumeno, who already seems like an old pro at radio. She actually gets the show moving, after the usual opening by Kisora, by saying that she’s listened to all of the show so far (which isn’t a huge feat; it’s maybe 12 minutes of actual content, but we’ll let her have it) and it sounded like so much fun. As a result, she was very eager to come and do her recording for the show, but once she actually got to the studio and went into the recording room, she got very nervous. Kisora sympathizes, as this is her fourth show and she still hasn’t settled in to the process yet. Still, Yumeno is excited to get talking because she and Kisora are rarely paired up for anything within Tsubaki Factory, so she hopes to have some interesting conversation. I imagine their relationship being a lot like this. Fan Letter #1 – The first letter is from Yabako. They have a story to tell about going to yakiniku with their younger siblings who are both in middle school. To their surprise, their younger siblings grilled the meat for them for the first time, even though Yabako had been grilling the meat for them their whole lives. It was a strange but heartwarming experience knowing that her siblings were growing up and becoming responsible. For some context, yakiniku is meat prepared over an open grill at the table, and generally 1 or 2 people are expected to be responsible for cooking the food for the the rest of the table. Children generally don’t do much grilling, for reasons that should be obvious, so it’s a sign that Yabako’s siblings are maturing and becoming capable people for them to now do the grilling for her instead of the other way around. It warms the soul. Kisora is back at it in week 3, although now I’m starting to suspect she’s messing with us when she tells us to listen until the end. She’s done this too many times now to not know how short the show is. That seems like something she’d do. Anyway, tonight’s guest is Tsubaki Factory’s own child of mystery, Tanimoto Ami. You can’t miss her, because she is speaking very loudly. While Kisora actually has a very pleasant voice for radio, very calm and soothing, Ami’s voice… is not that. There is something to be said for her unbridled enthusiasm, however, as she interrupts Kisora to say just how much she has been looking forward to doing this. Kisora regains control because she knows they’re on a schedule, and we go straight into fan letters. It’s going to be a long show for you today. Fan Letter #1 – Dokoroma writes the first letter as a comment of encouragement. They say that Ami always makes such funny jokes and comments about everything, it always makes them laugh out loud. They say that the hurdle must be getting pretty high now that she’s established herself as being this funny (which tickles Kisora to bits), so they hope she’ll continue doing her best to be entertaining. This seems to stress Ami out more than anything, as she interrupts Kisora reading the letter, but Kisora assures her that she’s funny so she shouldn’t worry. 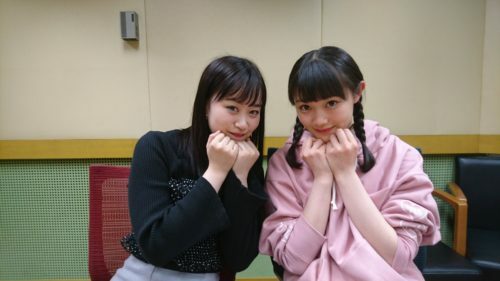 And we’re back with week two of Tsubaki Factory’s limited engagement radio show. Kisora starts the show up as such, and asks that we please try to listen to the end. It’s a heavy request, to listen fully to their 10 minute radio show, but I shall soldier on. I shall heed your request. Sub-leader Ogata Risa is the special guest Tsubaki for today, and Kisora thinks that perhaps because this is the second show, she’ll be able to relax a bit more. However, this is a zippy program, so it’s on to the fan letters! 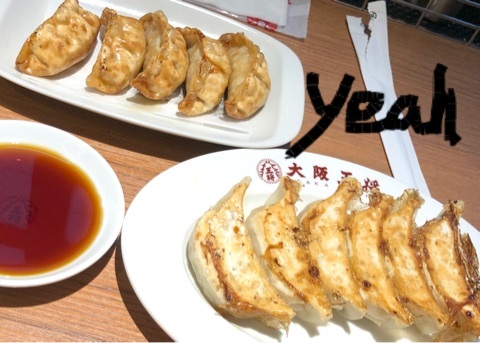 Fan Letter #1 – Our first letter comes from Kazukun, although Maiamia asks the same thing, and they want to know what the Tsubakis are going to call their fans on their radio show. As you may have noticed, if you’ve read any of this site at all, a lot of people who write in to these shows do not use their real names. This phenomenon, known as “radio name,” is the result of both protection of personal privacy and wanting to be better identified if their letters are read on the air. In this case, the fans want to call their radio names something special for this show. Kazukun suggests camellia name, keeping in theme with the show title and group name. Ogata thinks that’s just fine, since it is topical, and they decide to move on while keeping in mind that everyone is now using a camellia name and not just a radio name. 10 minutes of weekly Tsubaki Factory goodness. No, not Saori’s elbow… well, maybe. This is a limited-time engagement, scheduled to run for 3 months, but knowing H!P’s history with regular radio engagements, it may turn into a more permanent show. Time will tell. In any case, I will be around to summarize the goings-on of those three months, starting now!